Ever-increasing SKUs, limited space and tougher than ever order processing requirements; a common and stressful combination of pressures plaguing many distribution centers. If your facility is one of them, a multi-level pick module may be just what you need to fully optimize your storage space and increase picking and order fulfillment efficiency. Usually implemented in high volume/high throughput environments, the experienced team at Morrison Company will design a custom pick module for your specific order throughput needs. We analyze your floor space, picking technology, future growth plans and more to plan out your pick module components. Selective pallet rack (with or without decks), steel shelving, push-back, gravity flow (carton and/or pallet), and other storage methods as well as conveyors may be utilized to optimize product flow. 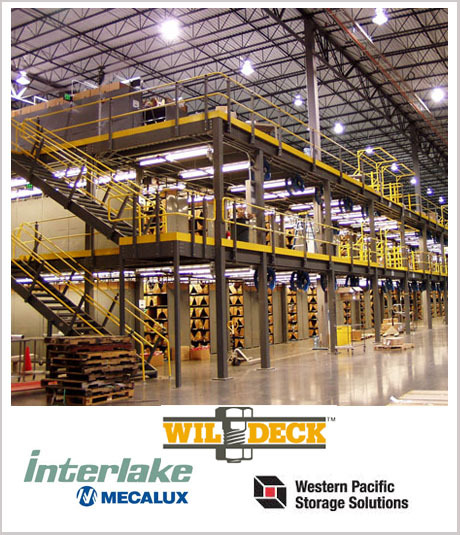 Morrison Company is recognized as a top producing material handling distributor for Interlake Mecalux, Western Pacific and Wildeck in the U.S. Pick Modules designed for retail and E-commerce accounts rely on Morrison shelving modules for condensed, organized storage and fast, efficient order fulfillment. For slightly faster moving items, gravity-fed carton flow provides selectivity with reserve storage (6-8 deep) within pick modules for full carton or each picks. Full case order selection from pallet flow within pick modules offers high density, high throughput order selection.